About SecuritySystems.Net service: The reviews and information expressed on this site are the opinion of securitysystems.net and are subject to change. To keep this valuable service free, we generate advertising revenue from some of the companies listed on this website. Identity security is a fundamental part of a home security strategy. The average cost of identity theft exceeds $2000 not including longer term issues with credit, and incredible time and stress of the victims. Using a home security system is useless without also protecting your identity. The most damaging theft goes unseen and involves stealing or “borrowing” your identity, putting both your home, your reputation, and your financial future at risk. The U.S. Bureau of Justice Statistics defines identity theft as "the unauthorized use or attempted use of an existing credit card or another type of existing account, the unauthorized use of personal information to open a new account or for another fraudulent purpose, or a combination of these." According to the BJS, in 2010, the last year statistics are available, 8.6 million households were the victims of identity theft, causing $13.3 billion in direct financial losses. The average loss was $2,200. Some signs you may be the victim of identity theft include bills, insurance forms and tax forms not arriving on time or at all. Other signs include fraudulent transactions on your bank or credit- card statement and leaders calling about loans you never applied for. Identity theft isn’t just an invasion of privacy, it can cause serious damage to your credit score and finances. They may also ruin your reputation by filing for bankruptcy in your name after they have incurred large debt. Why do thieves steal others identity? They use the victim's credit history to take out mortgages and car loans. They open credit-card accounts, make many purchases and never pay the bill. They use someone else's identity to commit crimes or acts of terrorism. They use someone else's identity for a fake passport to bring someone into the country illegally. How to thieves obtain your identity? There are many ways. These are a few examples. When you pay at a restaurant by credit card and your card is out of your sight, it can be scanned by a card reader by the server or other employees. They steal mail from business’s outboxes or home mailboxes or go searching through the trash for discarded credit card applications, canceled checks or credit-card statements. Stealing wallets and purses, or stealing things like birth certificates during a home burglary. Pretending to be a business person or government official collecting data. Using the information of a friend or relative. Looking over the shoulder of someone as they punch in a credit or debit card number or listening as the victim gives out his/her credit or debit card number out during a telephone conversation. Taking a photograph of someone else’s credit card with a cell phone. Legitimate-looking emails and websites which will ask you for personal and financial data. These websites pose as bank sites, social networking sites and government sites. 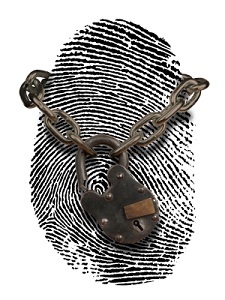 So what can be done to protect you and your family from identity theft? Create a strong, unique password for every website. It should be at least eight characters long and contain at least one number and symbol and use a combination of lower and upper case letters. Avoid using any word which appears in the dictionary spelled backward or forward, sequences of letters or numbers or contains personal information. Once you have established a password, don’t share it with others and change it often. When joining blogging, social networking and other sites, give as little information about yourself as the site will permit. If you need a screen name, pick one that won’t reveal your identity. Read privacy and security policies before joining blogging and social networking sites. Once you join a site, use its privacy settings. Never accept that default settings will protect you. Never click on links in emails that look suspicious. Verify that alerts are actually from the website the email claims. Never post online your address, phone number, birth date, birth place, email address, driver’s license number, Social Security Number, school name or student ID number. Never post photos that reveal where you live or work. The same goes for your friends and family members. Never posts your children’s full names and birth dates. Monitor your credit accounts with the credit bureaus as well as all your financial and credit-card accounts. If you see something suspicious, take steps to correct it. In addition, regularly do web searches for yourself and correct anything which shouldn’t be there. Ask friends and family not to post photos of you or your family without permission. Don’t put envelopes with bill payments or personal information in your home’s mail box. Instead take it to a postal service mailbox or, ideally, into the post office. These are a handful of great resources for learning more about identity theft and how to prevent it.